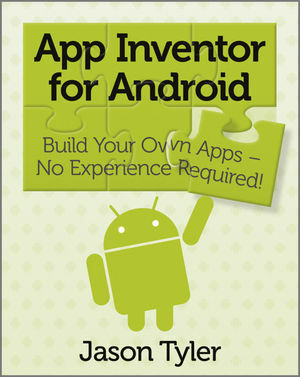 App Inventor for Android: Build Your Own Apps - No Experience Required! Create Android mobile apps, no programming required! Even with limited programming experience, you can easily learn to create apps for the Android platform with this complete guide to App Inventor for Android. App Inventor for Android is a visual language that relies on simple programming blocks that users can drag and drop to create apps. This handy book gives you a series of fully worked-out apps, complete with their programming blocks, which you can customize for your own use or use as a starting point for creating the next killer app. And it's all without writing a single line of code. Don't miss the book's special section on Apps Inventor Design Patterns, which explains computer terms in simple terms and is an invaluable basic reference. With App Inventor for Android and this complete guide, you'll soon be creating apps that incorporate all of the Android smartphone's fun features, such as the accelerometer, GPS, messaging, and more. Jason Tyler is passionate about technology and people. Jason teaches technology professionally to help people achieve their goals using the power of technology. He plays with technology because he loves the empowerment that technology can bring, and also because he is attracted to anything shiny. Jason is a lifetime student who considers a day wasted if he is not awed by something. His passion for technology has lead him to hold multiple certifications from Microsoft, Cisco, CompTIA, and ITIL. His passion for people led him to seek a B. A. in theology. Jason is an avid and dedicated photographer, sailor, and gamer. Of all the things he is, Jason is proudest to be the husband of Rebecca and the father of Liam and Declan. CHAPTER 1: Building Your First App While Exploring the Interface. CHAPTER 2: Programming and Design Fundamentals. CHAPTER 3: SounDroid: Creating an Android Sound Machine. CHAPTER 4: OrderDroid: A Maintainable Mobile Commerce App. CHAPTER 5: AndroidDown: A Location-Aware Panic Button. CHAPTER 6: AlphaDroid: An Alphabet Tracing Game. CHAPTER 7: PunchDroid: An Android Punch Bug Game. CHAPTER 8: Collection Assistant: A Barcode and Database Application. CHAPTER 9: BlueChat: A Bluetooth Chat Client. CHAPTER 10: TwiTorial: A Twitter Application. Part III: Blocks and Component Reference. APPENDIX A: Setting Up Your Phone and Computer. APPENDIX B: Creating Your Own TinyWebDB. BONUS CHAPTER: Sprite Interaction: A Physics Primer.